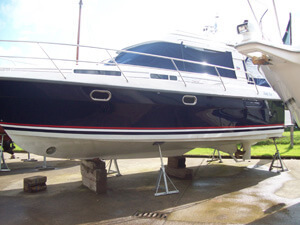 Our fully galvanized, bespoke cradles are designed to operate in conjunction with our boat lift system. 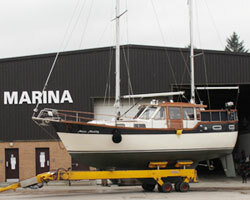 What this means to the customer is that unlike any other marina their boat can be moved (at no cost to the customer) to suit if needed and not boxed in and unmovable until the season begins. Unlike any other marina the Customer is not charged for the rental of the cradle, no matter the length of time it is in use. They are rated in tonnages of vessel and are fully adjustable to suit all keeled yachts. 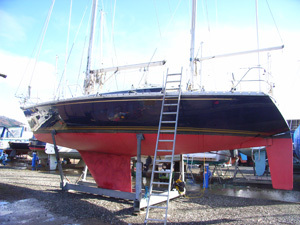 This also means that masts do not need to be un-stepped during winter lay up. We have a man basket which the customer can utilise to allow access to mast head lights, radars etc for inspection. This is charged at a time in use basis. The hard standing area is equipped with power and water bollards which means wherever you are in the yard, your vessel is never far way from services. 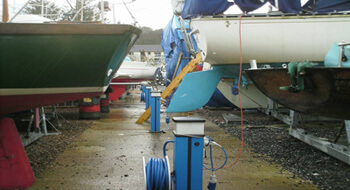 Motor vessels are blocked using treated timbers and galvanised keel stands to support downward pressure and Tennemast prop stands are used to support lateral movement. No barrels are used for blocking off. 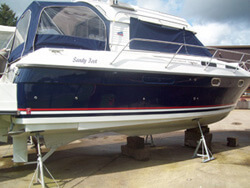 includes lift pressure wash craddle/blocks and launch.